The Institute Management Committee's 2018 Annual General Meeting was held on Wednesday 23rd May. An increased number of bookings during 2017 led to the Institute’s best ever revenue income. It’s worth noting as well as a good number of one off individual bookings we have benefited from an increase in the number of community benefit classes running in the Institute for the village. Bookings for events such as Slimming World, Pilates, Keep Fit and Zumba are well attended by villagers, but they are effectively business bookings and therefore attract a higher hourly charge. With such good financial news to start my report I must immediately highlight that the person these extra bookings create the work for is our wonderful Hall Manager Lucy. She not only has to deal with the bookings, but also has to try and fit cleaning and maintenance work in around the bookings – not and easy task when you have bookings running back to back. Thank you Lucy. I must also thank Lucy’s husband Reg who often completes odd jobs for us around the building to keep the place operational. We are currently in the process of undertaking work in several areas. In the kitchen the laminate on some of the doors is peeling and so these are being replaced imminently. The oven has been fully serviced by a professional catering equipment expert and we have replaced the lower tray and plate holders in the dishwasher. 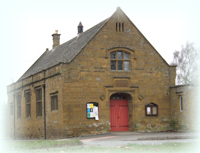 After the back upstairs room was vacated by Adderbury Theatre Workshop it became available for all users of the building as a break-out area. We’ve had the heating system extended to this area and know some people already make use of the space. We are waiting to redecorate the area but first need to have the window fixed or replaced; it currently doesn’t close properly and isn’t double glazed. This has turned into something of a mission as most traders shy away from the job. The experts we have found are not cheap with the work costing in excess of £1,400! We did discover some damage to the wall in this same room caused by children after a New years Eve party, but thankfully the parents of those responsible took steps to rectify the issue. We’ve also had to contend with users blocking the toilets and issues with the drains. Plus we had planned to fully reinstate the partially installed hearing loop system. However, some helpful soul unbeknown to us tried to do this themselves and in doing so incorrectly wired the system which would appear to have done irreversible damage to the amplifier. It is worth noting the new GDPR rules which come into force on Friday which will be discussed by the Committee immediately after the AGM. I am fairly happy that we will be prepared and compliant which is good news because I think many village organisations don’t realise the implications for non-compliance. Our village’s main community hub was used for parties and celebrations, meetings, keep fit, health and wellbeing sessions, film screenings and amateur dramatics, music workshops, youth and senior group meetings and a raft of other community activities. I have now mentioned for the last three years that the time is right for us to look at the fees we charge, but again this year we haven’t put through any increases. It is great that so many villagers and village groups are making use of the Institute and give us such positive feedback. Of course there are always those that aren’t happy. As a management committee we are told very occasionally that the Institute is already “too expensive”. Sadly the reality is that some other village buildings are probably under charging. We set our hire rates based on the realistic cost of running the Institute, including a contingency fund so we can deal with problems when they arise. As part of my role with Working For Adderbury Community (WFAC) I have visited a number of other community buildings in Oxfordshire, most of which charge more than the Institute. We have held our prices, but our service costs are rising and increased usage means increased ware and tare. Another issue we sometimes hear about is that of availability. In days gone by the Institute was used a couple of times a week and so one group could easily block book the Institute. Today the building is busy and as a Committee we have a simple rule of first come first served. No one group or booking is more important than another. I realise this is not helpful to some who prefer exclusive building use, but the building is for everyone and no one group or individual should be treated adversely because of another. We do our best to fit everyone in, but for some the new Community building on the Milton Road will ultimately be better suited to their requirements. It is worth mentioning in conclusion that whilst the Institute has just had it’s most successful year in terms of income revenue, this has been achieved by a very small Committee of just four people. I mentioned and thanked Lucy our Hall Manager earlier. I also must offer a huge amount of gratitude to our Treasurer, Sandra. I know Sandra’s work life has been “hectic” during the last year, but she has still managed to keep everything in order financially for the Institute. Thank you Sandra. The other member of our team is Anne who continues to offer us her support, knowledge and guidance at Committee meetings and within the various email chains between meetings. Thank you Anne.